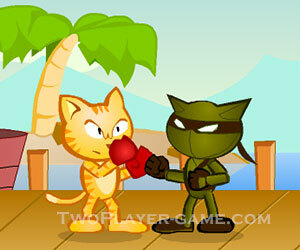 Paw Paw Miaw, 2 player games, Play Paw Paw Miaw Game at twoplayer-game.com. Choose your cat fighter and then try to beat all the other types of cats in this fighting game.Fighter cats are going up to arena to square accounts with each other. Proving the best one is getting through winning this battle. After game has been loaded choose game mode according to player number, "Story Mode" or "2 Player Mode". Then choose your fighters and assign chapter to begin. First player navigates with "Arrow Keys" and fights with "O,P" keys. Second player navigates with "W,A,S,D" keys and fights with "G,H" keys. May be the best man win.Enjoy!